Cafe Coffee Day is a coffee shop for the young and the young at heart. Here’s something to keep your conversations going! 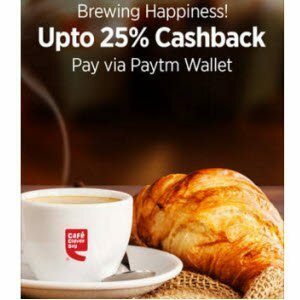 Delightful bites, a refreshing coffee and now get 25% cashback at Café Coffee Day using PayTm wallet. This Offer is valid at all Café Coffee Day outlets across India except Coffee Day Lounge, Coffee Day Square, discounted and airport cafes. This Offer cannot be clubbed with any other offer or promotion.This Offer should be availed and consumed in one bill. About the merchant♦Cafe Coffee Day is a coffee shop for the young and the young at heart. We’re part of Coffee Day Global Limited. We source our coffees from thousands of small coffee planters. They and the many plantation workers have truly made us who we are today and we’re glad to be a part of their lives. Popularly known as CCD, we strive to provide the best experience to our guests. To put it plainly, we brought in the concept of cafes to India (this is where you thank us!). The first one opened in 1996 on Brigade Road in Bangalore and continues to be one of the most happening places in the city. The young and the young at heart immediately took to the place. A smart, simple space that they could call their own for a while sit down, talk and listen to conversations, hold short meetings or even have a lot of good fun all over steaming cups of coffee. ♦ Minimum transaction of Rs.300 (exclusive of taxes) is required for this offer. (It would sum upto Rs.343 including taxes). ♦ This Offer is valid at all Café Coffee Day outlets across India except Coffee Day Lounge, Coffee Day Square, discounted and airport cafes. ♦.This Offer cannot be clubbed with any other offer or promotion.This Offer should be availed and consumed in one bill. ♦ The Offer is valid on amount exclusive of taxes.